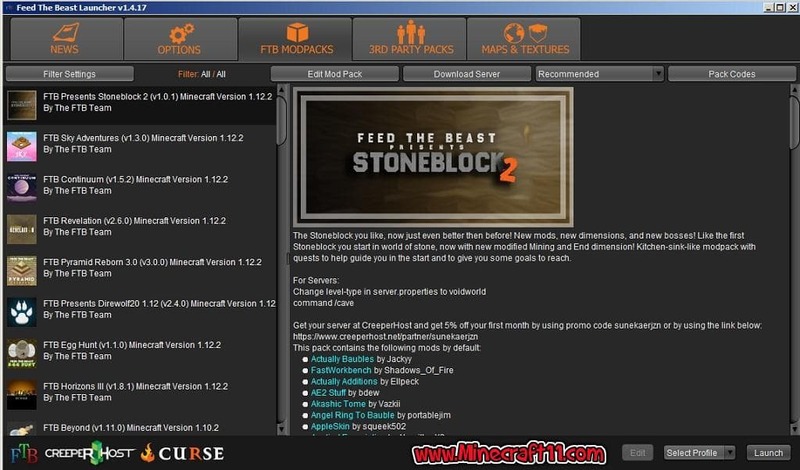 FTB Legacy Launcher download 2019 is a free launcher program designed to work alongside Feed the Beast modpacks. So, if you are a fan of the Feed the Beast game, then this is something that you may well find useful. It has a range of options to enhance your Feed The Beast experience the next time you play the game. The steps above pertain to the legacy FTB launcher. FTB has switched support to the Twitch app, which can be downloaded. Download the .exe or .app file. Navigate to the .exe or .app file on your computer and open it. Login with your Twitch credentials. Once you have Minecraft successfully running on its own you are ready to install the FTB Launcher. The FTB Launcher is depreciated by FTB Team who instead recommend the Twitch Desktop App, but the latter currently doesn’t support Linux, and there are also a few older third-party modpacks that cannot be downloaded using the Twitch Desktop App yet. Browse to the FTB site and download the .exe or .jar. Put the .exe or .jar in its own folder somewhere on your computer. Run the .exe or .jar. It may take some time for it to configure itself the first time. Click on the OPTIONS tab and configure the installation location, memory settings, and window size/position. Create a profile using your Minecraft username (or Mojang e-mail) and password. There are many FTB modpacks. The Twitch Desktop App can also be used to install many other modpacks from other creators as well. Click on the “Mods” at the top sidebar, and then “Minecraft.” If it is not there, check if the app’s settings has mod management on for Minecraft. This will bring you to the profiles page. Click on the desired modpack. Click “Install” by the top-left corner. Navigate back to the profiles page. Click “Play” to load up the Minecraft launcher. In the launcher’s main window click on the “FTB MODPACKS” tab. In the launcher’s main window click on the “3RD PARTY PACKS” tab. Click on the “Pack Codes” button on the right. Write in the pack code and click “Add”. Find your pack in the list on the left, and click on it. The launcher will list the mods that make up that pack.